A cataract develops when the lens in the eye becomes cloudy, leading to blurred vision. A cataract is an age-related change in the properties of the lens, and it will affect everyone to some extent, sooner or later. Cataract is most common in people over 60 years, but it can develop at any age. The progress of the condition is gradual, and the progression is usually more rapid in younger persons. The most common symptom is loss of visual acuity. The vision becomes misty or cloudy. Other typical symptoms in cataract patients are problems with dazzling, increased sensitivity to light, changes in colour perception and difficulties in discerning contours. The only treatment for cataract is surgery. This used to be a major procedure that required several months of convalescence. Things are different now. Advanced surgical procedures make a gentle and effective treatment possible. 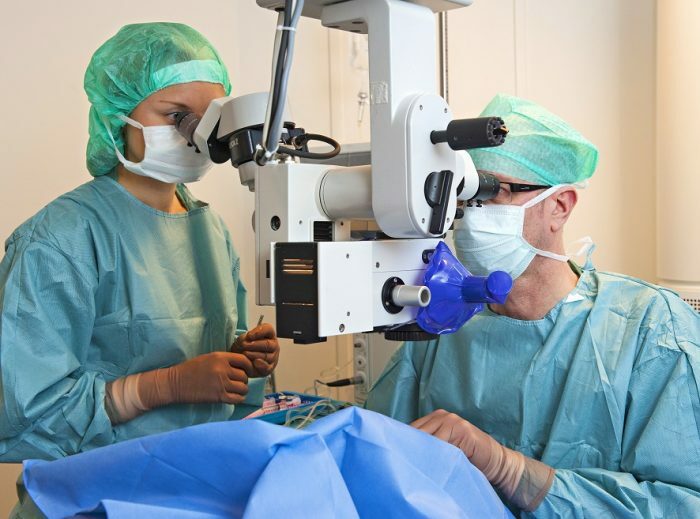 At Stockholms Ögonklinik we have the very latest equipment for cataract surgery. Our experienced surgeons use state of the art techniques with very small incisions and sophisticated ultrasound, resulting in minimal trauma and rapid healing. The cloudy lens is removed during the procedure and replaced by an artificial lens. Many people believe that laser is used for cataract surgery, but it is, in fact, performed using ultrasound. The procedure takes place under local anaesthesia and is essentially painless. The actual surgery only takes 10-15 minutes, and you leave the clinic within one hour following surgery. Symptoms are eliminated by the procedure, and your vision is restored. Many who undergo cataract surgery also suffer from diabetes, glaucoma, and macula degeneration. Any changes or problems in the eye that are due to another eye condition will not, of course, be cured by cataract surgery. We offer this treatment to both private patients and under the terms of our contract with Stockholms Läns Landsting. We carry out cataract surgery under the provisions of Vårdval Stockholm, applying the fee structure determined by the county council. A private consultation costs SEK 1,600 and the surgery costs SEK 15,500 for each eye. Most people experience greatly improved vision after cataract surgery. Careful measurements of the length of the eye and the curvature of the cornea are made before the procedure in order to calculate the strength of the artificial lens needed. The excellent monofocal lenses that we usually implant correct for distance vision, requiring patient to use reading glasses. Most patients are content to only need to use reading glasses after the surgery, and not to need glasses when living or watching TV. It is not possible, however, for all patients to achieve freedom from glasses for distance vision. This may be caused by the eye having substantial astigmatism that the new lens cannot correct. It may also be caused by the position of the lens in the eye varying somewhat from one patient to the next, something that it is not possible to predict with complete accuracy. Your eye surgeon will be able to determine whether you are a suitable candidate who can benefit from the various premium lenses that are available. Do you want to eliminate age-related shortsightedness and be able to see well without spectacles, both for near and distant vision after cataract surgery? Several bifocal lenses are now available, however the cost for these are not covered by national health insurance. If you have undergone conventional cataract surgery and now want to have a bifocal lens, it is possible to insert an additional lens in front of the lens that previously has been surgically inserted. If you are suffering from any other eye condition than cataract, such as macular degeneration, glaucoma or changes in the retina due to diabetes, we do not normally recommend the use of bifocal lenses, since these provide the best results in otherwise healthy eyes. Patients with severe astigmatism can have this corrected during cataract surgery, enabling them to achieve good distance vision without spectacles. The lenses required are tailored for each individual, and must be paid for by the patient. Only reading glasses are required after the procedure, since this special lens improves only distance vision. Extensive examination and consultation are required before any of these special lenses can be fitted. If you are interested in these possibilities, contact us by telephone (+46 8 5089 4911) to order some printed information or to make an appointment for the extensive preliminary examination. The telephone is open on Monday-Friday, 8.30-12.00 am and 1.00-3.30 pm. Occasionally minor correction of the refraction is needed following surgery with a premium lens.